The Math Mom: What do Nobel Prize winner and Donald Duck have in common? What do Nobel Prize winner and Donald Duck have in common? 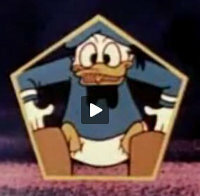 Here are few amazing videos where the old Donald Duck and the young math whiz share the obsessive, captivating, mysterious, applicative and beautiful math. These links have been added to The Math Mom's Math Resources Page. Please remember to check this page anytime you are looking for interactive math CD-Roms, iPhone apps, books, TV programs, toys etc.